Why Don't I See 'Find Similar Images' in Google Yet? 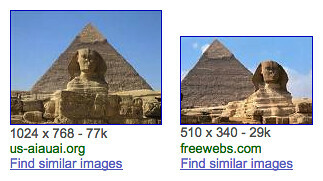 Home > Google News > Why Don't I See 'Find Similar Images' in Google Yet? It has been just about two days since Google announced they have graduated the find similar images features from labs to the main Google Image Search. But even now, I do not see it. I see it on similar-images.googlelabs.com but not on images.google.com. I tried Safari, Firefox, logging in and out - but no luck. The feature is really nice and fun to play with but can you get to it?